It was a weekend for using up scrap yarn. I made this with the half skeins left from the Wee Waves Hat and with a little scrap of vintage pink Patons Astra yarn. So, unless you have a stash of vintage yarn like I do, you will probably need to find a suitable replacement for the second contrast color (look for a nice wool blend medium weight 4 ply). Contrast Colors: 1/5th+ skein (roughly) of Martha Stewart Crafts Extra Soft Wool Blend in Gray Pearl and 1/8th+ skein (roughly) Patons Astra in Deep Pink (or any other 4 ply yarn). Using Winter Sky yarn, cast on 80 stitches. Join and place marker. Work in knit 1, purl 1 rib for 5 rows. Knit 3 rows in stockinette stitch. After finishing the 6 rows of the chart, knit 3 rows with main color in stockinette stitch. Knit 3 rows with main color in stockinette stitch. 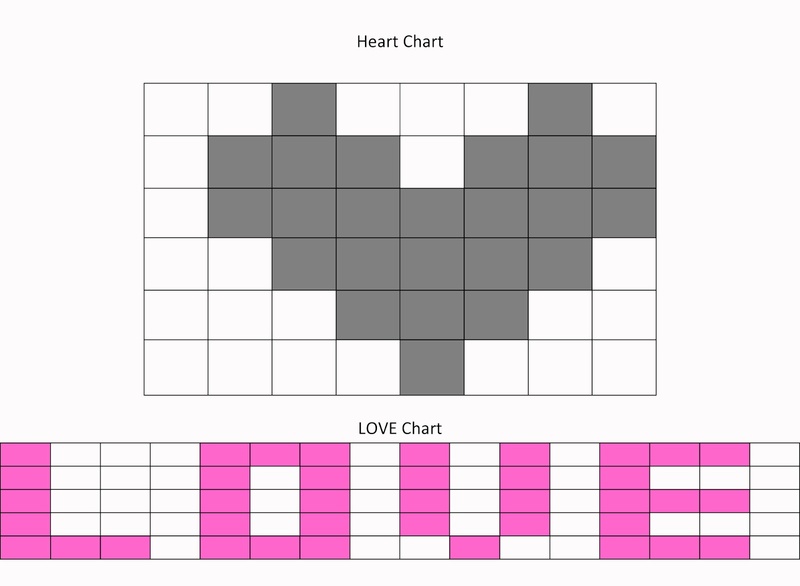 Repeat Heart Chart over the next 6 rows, repeating chart 10 times for each row. Row 1: Knit 8,K2tog. Repeat 7 times more. Row 2: Knit 7, K2tog. Repeat 7 times more. Row 3: Knit 6, K2tog. Repeat 7 times more. Row 4: Knit 5, K2tog. Repeat 7 times more. Row 5: Knit 4, K2tog. Repeat 7 times more. Row 6: Knit 3, K2tog. Repeat 7 times more. Row 7: Knit 2, K2tog. Repeat 7 times more. Row 8: Knit, K2tog. Repeat 7 times more. Row 9: K2tog. Repeat 7 times more. Slide first 4 stitches onto stitch holder, leaving working yarn at one end of needles. With last four stitches and working yarn from project, knit i-cord for 6 inches. After finishing the cord off and securing end, take stitches from stitch holder and work into a second i-cord for 6 inches. Tie i-cords into bow to top hat.